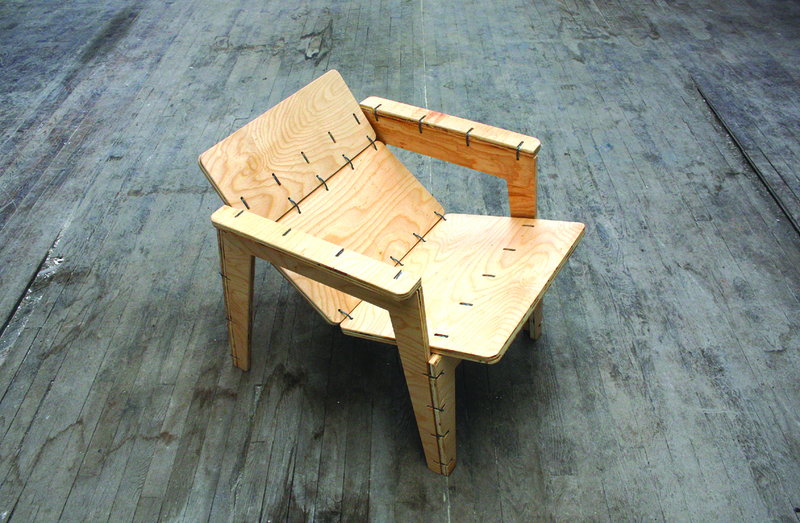 Transform 44 cable fasteners and a half-sheet of plywood into a streamlined lounge chair that’s perfect for the nomadic maker. The iconic Steam-Bent Chair No. 14, invented by Michael Thonet in 1859, was the first flat-pack furniture kit. It was shipped across Europe on then-new railways, becoming one of the most popular chairs ever made. CNC manufacturing gives us the ability to do Mr. Thonet one better, distributing the information about the chair instead of the chair itself. Using new digital tools, I spent 6 months designing and prototyping the Zip Tie Lounge Chair, a low-key living room companion for makers on the move. It goes together (and comes apart) in minutes and costs less than $50. Download the files and assembly instructions from OpenDesk (opendesk.cc/designers/will-holman), and translate the DXF drawing into toolpaths using your favorite CAM program. Red: Profile toolpath, cut through the material on the outside of the vector. Add at least 3 tabs per piece to hold parts in place. Secure the plywood to the spoil board with screws. Note that there’s a 1-1/4" border built into the file for screw clearance. Choose your tooling. I used a 1/4" upcut endmill. Home the x and y axes, then calibrate the z-height. Run the toolpaths. Cut through the tabs with a pull saw. Sand the faces with an orbital sander and ease the edges with a sanding block. Apply finish of your choice — I used butcher block oil and citrus based wax for an Earth-friendly shine. Fasten the arms to the side frames by feeding zip ties through the matching holes and pulling tight. Secure the sides to the front and back frames, forming a box. Attach the seat to the base through the middle of the first and last seat panels. This is a bit tricky; it helps to lay the chair frame on its side so you don’t have to support the weight as you attempt to tighten the zip ties. Then snip off the tails of the zip ties. Add a thin cushion made from closed-cell foam camping pads for extra comfort.